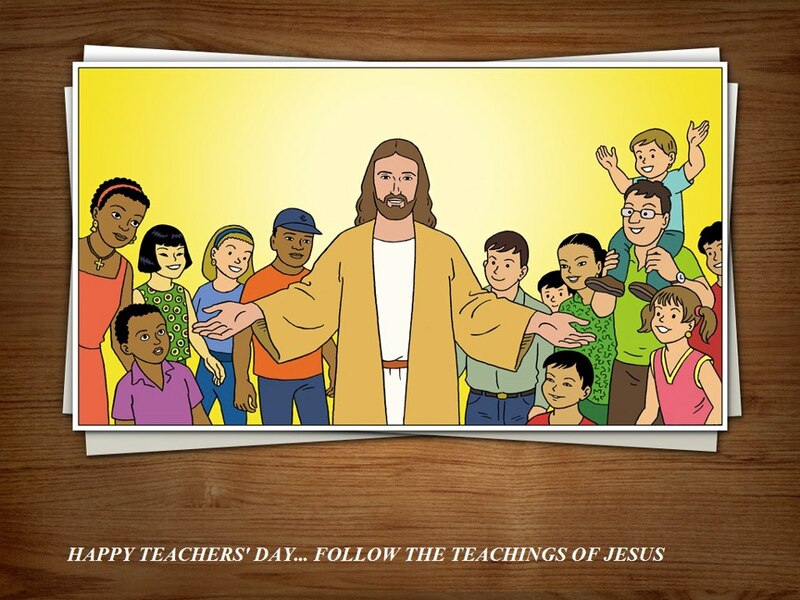 Apostolic Titbits: I Wish You All A Happy Teacher's Day! I Wish You All A Happy Teacher's Day! The United Nations' (UN) World Teachers' Day celebrates the role teachers play in providing quality education at all levels. This enables children and adults of all ages to learn to take part in and contribute to their local community and global society. On this auspicious day we must thank God for all the teachers who have taught us in school, college and further to make us grow intellectually, and more than that we must thank God for all the spiritual teachers who have taught us and still teach us the word of God to make us grow spiritually which will benefit us for now and for eternity ahead (Eph 4:11). Let us also remember our teachers and say a word of appreciation for what they do or give them a gift to acknowledge their work which they have done and still do today (Gal 6:6). Teachers are more like candles, they burn themselves by sacrificing their time so much to give us the right healthy information that we need to grow. The teacher of all teachers is none other than Jesus Christ. The Bible says, "Jesus began both to do and teach" (Acts 1:1). From the above verse we know that Jesus never taught anybody what He himself never practiced. Because Jesus taught his followers by doing what He spoke and inspiring them with his life testimony, they always called Him as "Rabbi" in Aramaic which means Teacher. Jesus never denied that He was primarily the true teacher of the word of God. Thus the day before He died for the sins of all His followers, Jesus washed the feet of His students and said to them, "12 ...., “Do you know what I have done to you? 13 You call Me Teacher and Lord, and you say well, for so I am. 14 If I then, your Lord and Teacher, have washed your feet, you also ought to wash one another’s feet. 15 For I have given you an example, that you should do as I have done to you. 16 Most assuredly, I say to you, a servant is not greater than his master; nor is he who is sent greater than he who sent him. 17 If you know these things, blessed are you if you do them." (John 13:12-17). What can we learn from our Lord Jesus who is Teacher of all teachers? When we learn good things from the teachings of our Lord Jesus, that in itself carry a blessing along with it (Rev 1:3). But then there is a ultimate blessedness that comes over our lives when we do what we learn from the teachings of Jesus. Jesus washed humbly the feet of all his followers to teach them that only when they become a bond-servant to the people whom they teach on behalf of God, they can really become God's voice of being a Teacher to them. In the first century society, foot-washing was reserved for the lowliest of menial bond-servants. Peers did not wash one another's feet. But Jesus instructed His disciples who were arguing jealously to find who among themselves is the greatest of all once Jesus leaves them, were made to learn the truth that in the kingdom of God the one who serves all people by washing their feet is the one who is the greatest of all people (Luke 22:24-27). So from this we learn that we must have an inner attitude to be ready to wash the feet of all those who are peers and subordinates to us, as a mark of great love. In serving people, we actually serve God. Refusing to follow the example of Jesus is to exalt oneself above Him and to live in pride of the evil one (John 12:26), so we must learn day by day to not only understand more and more of Jesus' teaching, but also do what we learn in humility which will make us receive the grace of God to fulfill it all easily (James 4:6, 10). Most importantly we must thank and praise Jesus for having given His heavenly teaching in a practical day today simple way to apply it in our lives. May God help us all to grow spiritually through all the teaching's of our Lord Jesus which He has given as a gift to us all. I wish you all a "Happy Teacher's Day", by now you may be thinking am I a teacher really? Do not worry, every Christian is a teacher by calling because the great Apostle Paul said, "teach these [Bible] truths to other trustworthy people who will be able to pass them on to others" (2 Tim 2:2, NLT). May God help you to hear all the truth and live and then teach to as many people as possible in the coming days.